This week my project was to create something using items from a hardware store. 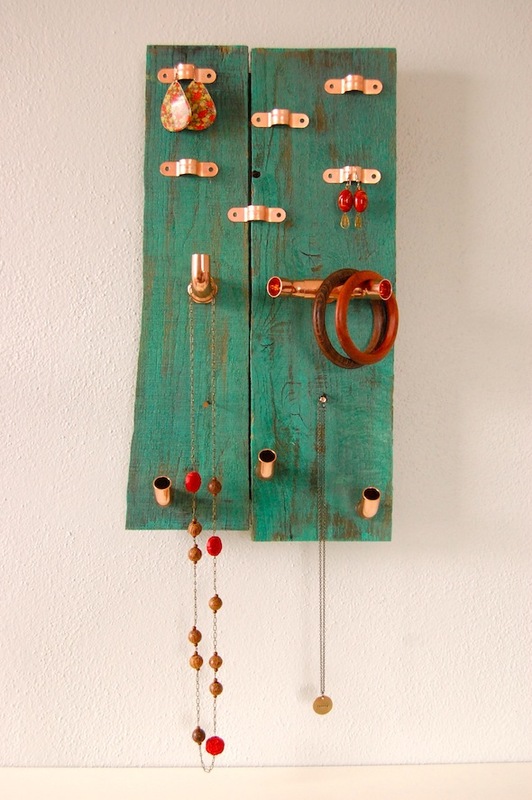 I created a jewelry holder using wooden pallet pieces, copper pipe fittings, teal wood stain, and some E-6000 glue. I went to the hardware store and was full of inspiration after the first couple of aisles. But when I got to the aisle of copper pipe fittings, I just couldn't stop thinking about them! So rich in colour, so pretty, so shiny and not too expensive either. Most of the pieces I bought were less than $1. But what to make with them? 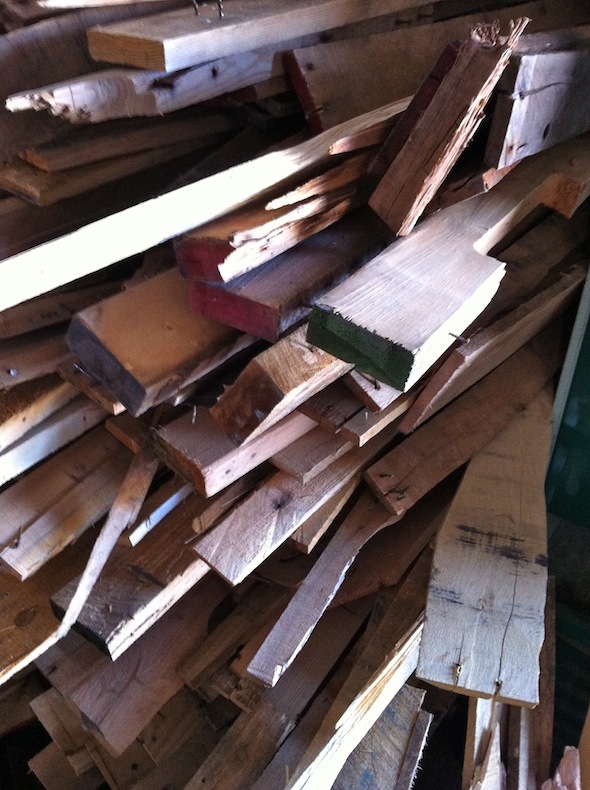 Once I found my way home from the store, I dug out a couple of pieces of pallet wood that we had stored in the garage. I found 2 of the darkest, most rustic looking pieces I could find, and used the saw to chop them down to a reasonable size. I cut the boards between the rusty nails and wasn't too picky about making them the exact same length. Then I sanded the pieces down a bit - I didn't want them to be smooth at all, but just enough to get rid of the splintery-pokey-outy bits. Next, I used a couple scrap pieces of MDF and screwed them on to the back of my pallet pieces to hold it all together. Once it was in one piece, I went outside to stain it. I was delighted to complete this step outside on a beautiful sunny day and it was only -4 degrees! Plus, the wood stain can cautioned me to work in a well ventilated area to avoid lead poisoning. Yikes! I was so pleased to find this lovely small can of teal wood stain in the 'oops' section for just $1. I did a really light coat and made sure not to cover the wood completely. After generously allowing a few hours of drying time, I arranged my copper pieces the way I wanted them. I used E-6000 to connect the copper to the wood and there is no chance of them falling off anytime soon. I piled a couple of pennies to add depth to one piece, but the glue was not the best at keeping the copper-to-copper parts together - I had to re-glue them. Once the glue was holding tightly, I hung it on my wall and bam! A colourful spot to hang my jewelry. What I enjoyed the most: I sure did have a fun time at the hardware store. An older gentleman employee approached me to ask if I needed help and I wasn't sure how he would react to: "I'm doing an art project and I'm not sure what direction to take yet." But he was great and offered lots of tips and ideas. Plus, now I've got a few ideas tucked away for next time! Next time I would... Not use cheap screws! That one simple step took way too long! When inspiration and creativity hit you at the same time, a masterpiece is in the making! And this is definitely how your project turned out, as it is both beautiful and functional. Also, it was a nice touch using the copper pipe fittings, they really look great and even add a vintage appeal. Two thumbs up! nice post .thanks for sharing step by step information.good idea.i appreciate your talent and creativity. Week 8: Go Take Some Pictures!